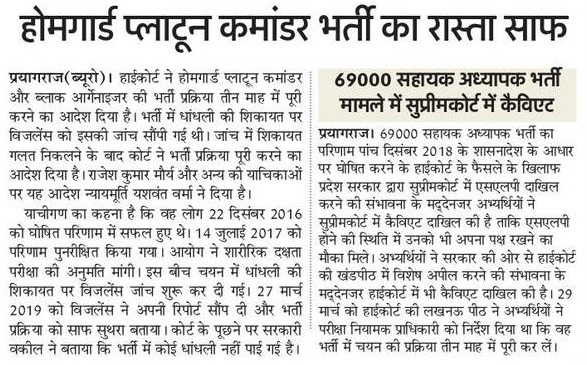 UP Block Organizer Recruitment 2019 after Court Case of Homeguard Platoon Commander & Block Organizer. UPSSSC Recruitment 2019 Link will add for both posts within 2 Months. Allahabad High Court has given order to fill Homeguard Platoon Commander, Block Organizer Vacancy with in 3 month of time. 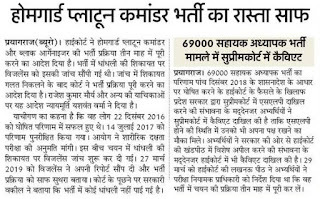 UPSSSC Block Organizer Recruitment 2019: Latest News 5 April 2019 Due to corruption (Dhandhali) in Platoon Commander & Block Organizer Jobs in UP this vacancy was stopped from many years. After verification, committee founds many false statement. So Allahabad High Court ordered to fill both important posts as soon as possible. 21 to 40 years as per govt rules. Latest News: Homeguard Platoon Commander Bharti result announced on 22 December 2016. UP Block Organizer Syllabus 2019: UPSSSC Ayog may conduct physical test for Homeguard Platoon Commander and Typing test or other skill test for Block Organizer. Educational Qualification: after searching online on Google we found block organizer types vacancy in MP, West Bengal and Tamil Nadu Salem District jobs for block organizer have eligibility is 12th pass only. Total Number of Vacancies: More than 100 to 200 jobs after result. Age Limit: 21 to 40 years of age limit is required in filling Block organizer. Age relaxation as per govt rules. UP Block Organizer Typing Syllabus: after written exam you will be called to attend typing test and Interview as per posts and UPSSSC Rules. Selection Process: Written exam, physical test, document verification and medical exam. Application Fees: Depended on ST SC OBC/General Fees. Opening Date of Online Form: 5 April Advertisement issued. Official Website: Uttar Pradesh Sub Ordinate Service Selection Board.